KUALA LUMPUR, 26 Feb 2014 – As many as 80 percent of caregivers of those suffering from dementia have very high stress levels with 50% reported to be clinically depressed. An expert in strategic communications in dementia from the University of Ohio in the United States, Prof Dr Brooke Hallowell said it is very important that the caregivers get help in counseling so that they can deal with the problem better. 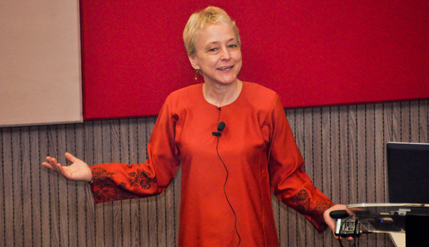 In a talk at the Advance Surgical Skills Centre of The National University of Malaysia (UKM) organised by the Faculty of Health Sciences, here today she said it could be very frustrating and sometimes hurtful when the person you lived with such as your spouse or parent don’t remember your name or worse still do not know who you are. Dementia is associated with a decline in memory or other thinking skills severe enough to reduce a person’s ability to perform everyday tasks. Unlike mourning a death, where the grief is about the loss of a loved one who will never be seen again, caregivers of people with dementia mourned for the loss of the character that they used to know, she said. However they cannot put it behind them or get closure because the person they are helpless about is still living with them. The frequent reported symptoms of the caregivers are anger, fatigue, sleeplessness, isolation and fear; but Prof Hallowell said there are ways to make the situation better particularly by improving communications. She had carried out extensive research on dementia in Malaysia and what she discovered was that one of the obstacles of getting help for the elderly who have dementia here is culture. In Asia it is a duty of the children to take care of their parents. She said while this is an honourable culture but there is a problem if the duty is carried out half heartedly. Because of the lack of awareness, they can make things worse for their parents who suffer from dementia. Parents are sometimes treated condescendingly and often corrected because of their forgetfulness. But this kind of teacher pupil attitude does not help in improving communications. Elderly with dementia is a person but often times they are told to keep quiet. They may forget crucial facts about themselves and others but they still have feelings, she said. Malaysia, she said cannot adopt a quick fix model from the west to solve the problem because it is most complex like even getting treatment to the sufferers is a feat in itself. It is because of the culture that the eldest children must take care of their parents and they rarely seek help, because of pride and competing priorities. It is much easier to live with the notion that there is nothing that can be done. Yet a lot can actually be done to improve the self esteem of the elderly with dementia and delay their conditions from deteriorating, she said. While it is an honorable culture to take care of the parents, the children needed to make sure that it would not get in the way of getting proper treatment. Both people living with dementia and the caregivers needed proper counseling on how to deal with the problem so as to remove unnecessary anxieties, Prof Hallowell said. Present at the talk was Dean of the Faculty of Health Sciences, Prof Dr Siti Zamratol Mai Sarah Mukari, medical practitioners and students.